Caverns aren’t limited to the southwest. Jen Mathews gives the lowdown on the eastern US’ best spots for caving. For those who have never ventured underground and don’t know how they will react to small spaces or dark areas, a commercial cavern tour might be a good way to start. Commercial caverns usually give guided tours along well-lit pathways and do not require visitors to demonstrate any prior caving experience. 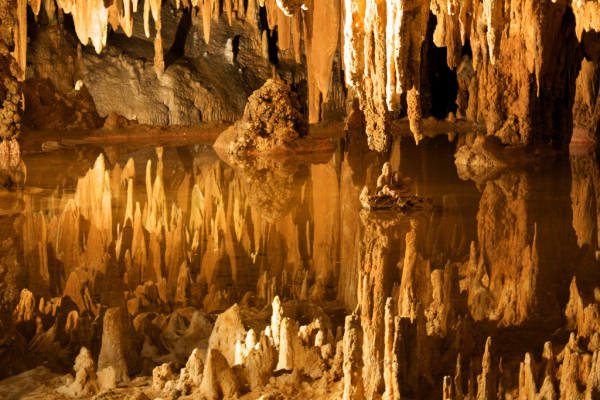 With its close proximity to the nation’s capital and Shenandoah National Park, Luray Caverns in Luray, Virginia, receives more than half a million visitors annually. 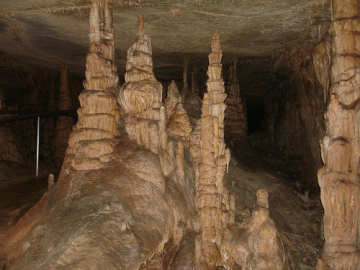 Like most commercial caverns, Luray gives its stalactites and stalagmites colorful names like “Titania’s Veil”, “Totem Poles”, and “Frozen Fountain”. Visitors can also listen to the “Great Stalacpipe Organ”, which is wired to tap different stalactites in the cavern to produce a melody. Other popular commercial caverns in the eastern US include DeSoto Caverns Park in Childersburg, Alabama; Ohio Caverns in West Liberty, Ohio; Indian Echo Caverns in Hummelstown, Pennsylvania; and Shenandoah Caverns in Shenandoah, Virginia. One word of caution: at a commercial cavern, plan to share your experience with many other tourists, mostly very young ones. On my visit to Luray Caverns, several school buses’ worth of children poured into the cave entrance just as I exited, and the caverns filled with noise. If you’re looking for a quiet and solitary cave experience, you usually won’t find it at a commercial cavern, especially during the warmer months or peak visiting hours. Though most commercial caverns have paved or smooth walking paths, some caves have underground rivers or streams that visitors explore by boat. At Bluespring Caverns in Bedford, Indiana, you might see blind crayfish and cavefish (which actually lack functional eyes) from an electric boat. Penn’s Cave in Centre Hall, Pennsylvania, has a one-hour tour through the caverns and on Lake Nitanee. At Lost River Cave and Valley in Bowling Green, Kentucky, ticket price includes a 20-minute walking tour and a 25-minute boat tour on which you might see cave crickets, crawfish, salamanders, and bats. Howe Caverns in Howes Cave, New York also combines a 15-minute boat ride with a walk through rock formations it claims is older than most fossils. If you’re ready to work your way up to a more authentic caving experience, many commercial caverns also take guided caving tours to wilder areas of the cave. These tours last longer and usually give you the opportunity to explore small, tight passageways under the supervision of a trained guide. At Cumberland Caverns in McMinnville, Tennessee, you can take a guided tour as short as three hours or as long as an overnight trip into the caverns. But if you don’t like small spaces, even beginner spelunking tours might not work for you: Cumberland Caverns’ smallest squeeze is only 11 inches high. You can also get started caving at Lost World Caverns in Lewisburg, West Virginia. Lost World Caverns provides the equipment you need for a 4-hour guided expedition through passageways with telling names like the “Birth Canal”. Check out the commercial caves in your area to see if they offer guided spelunking tours. You can get the thrill of exploring the natural areas of a cave, but with less worry over staying safe and having the right equipment. In terms of working your way up from beginner to more advanced caving, Mammoth Cave National Park in Kentucky has a good range of tours. Beginner tours start include a 30-minute, self-guided walking tour through the cave’s natural entrance or 1-2 hour guided group tours of some of the park’s underground features. 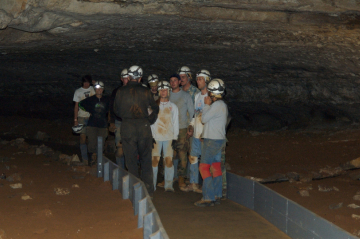 Beginning cavers can take a 3-hour Introduction to Caving tour at Mammoth Cave National Park that emphasizes safe caving techniques and environmental issues. Like other tours, this guided experience involves small spaces, crawling, and scaling cave walls. Mammoth Cave’s 6-hour Wild Cave Tour also gives participants the change to free climb, squeeze through passageways as small as 9 inches high, crawl through mud, and have an authentic caving experience. Many of the best areas for caving don’t give walking tours to the public. In fact, some caverns are located on private property or require permits to visit. It’s a good idea to join or work with local caving associations or experienced cavers to identify appropriate locations. When you’re ready to begin serious cave exploration on your own, it’s also important to have trusted partners with whom you can go caving. The nonprofit National Speleological Society can help you find a caving club in your area. Do you cave? Tell us about your favorite spot in the comments. Learn about cave diving and safety in our interview with Conrad Pfeifer, Cave Recovery Diver.